HOTEL | KEN Real Estate Lease Ltd.
Ken Real Estate Lease has throughout knowledge in hotel business. Our professional staff in assets, operations, marketing and other functions team led by Acquisition Department cooperate mutually to close each transaction on properties prior to its actual investment. We are capable and committed to making speedy and seamless business succession. Additionally, based on our long-term holding policy, we engage in diversified hotel operation that leverages the appeal of each hotel in accordance with a long-term vision. Furthermore, we are focusing on the development of new hotels. Ken Real Estate Lease is aiming to engage in the hotel investment and management practices that may well serve as an ideal model for the Japanese tourism and hospitality industry. Ken Real Estate Lease has fundamental policy in its acquisition and management of hotels through continuous employment of existing staff after its acquisitions, and operate hotel businesses with a high degree of ethics and ambition in order to contribute to the local community and economy in the medium to long term. In conducting acquisitions, our in-house professionals in real estate, accounting, legal affairs and various other fields proceed with their duties meticulously and with speed under the swift decision-making of our top management. In addition to usual transactions ie. actual real estate, trust beneficiary rights, M&As and various other transaction configurations, Ken Real Estate Lease is also capable of handling transactions involving complex relationships surrounding rights that tend to become shoving matches among rights holders. We are also simultaneously working to strengthen our new hotel development projects. Upon the development stage, we ensure that the resulting design is suitable for our unique style of operation and business plan. We place a strong emphasis on all design areas starting with architectural plans, construction and continuing all the way to interior design, and in parallel selecting the optimal hotel brand. 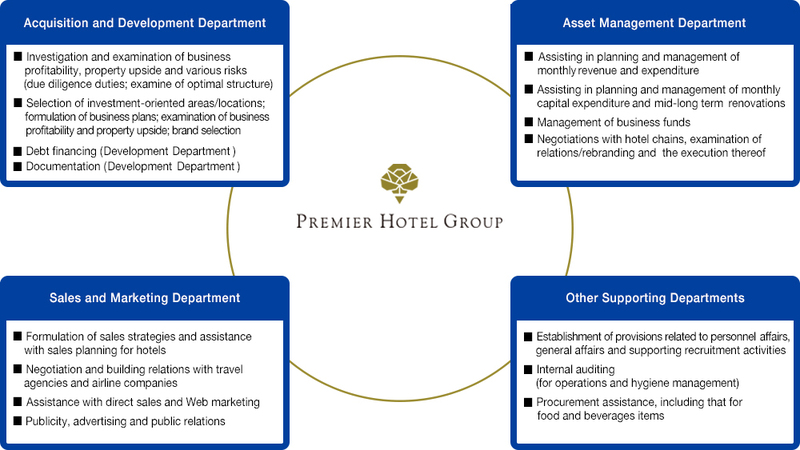 While placing our focus on a framework of independent operation, we have cultivated our “Premier Hotel Group” business platform based on our ardent desire to provide the highest-quality customer services in the hotel industry both in Japan and overseas market. Our affiliate, Ken Corporation is responsible for building high-end lease market in metropolitan, starting with residential brokerage services for foreigners. In order to fully manifest the DNA that we inherited from Ken Corporation in the form of its spirit of hospitality, we continue to expand our number of independently-operated facilities. At the same time, given elements such as the physical characteristics and history of each property and the market environment, Ken Real Estate Lease employs competitive brands that suit to the hotel in question, regardless of whether or not that brand is its own, and endeavors to maximize the earnings of each property. Through our partnerships with international hotel chains, we fully leverage the access to its diverse global sales networks of those brands to realize growth in our new customer base. Whether the agreement with the international hotel is on a franchise contract or on a management agreement, we place our emphasis on the incorporation of our management principles in operation of the property to the maximum extent possible. Using our appealing product planning based on our direct operation framework and our uniquely-formed sales channels, we endeavor to expand the sales of the hotels that we invest in. More specifically, we leverage our unique network, which covers direct sales to high-end lease customers of Ken Corporation and the sales channels we have built up alongside parties such as travel agencies and airlines, towards our efforts to draw in new customers. Going forward, we will endeavor to dramatically improve our earnings model for hotels by implementing a CRM (customer management system) and increasing the percentage of individual tourists who use destination hotels as their accommodations. Since its full-fledged entry into the hotel business in the outset of the 2000s, Ken Real Estate Lease has worked together with various hotel chains and has held and operated diverse types of hotel assets. Based on the resulting accumulation of experience and expertise, we now can conduct high-quality asset management focusing on the maximized earnings. We put our focus on creating an attractive product plans based on market research and our framework of direct operation as well as on our sales channels built up over the years supported by the bond relationships that we have formed together with travel agencies, airlines and other entities, utilizing all resourced to continue working in optimizing our earnings from hotel accommodations. We are also reinforcing our IT infrastructure and are endeavoring to further aggressively improve retaining the domestic and overseas travelers. Promptly and swiftly succeeding the business platform following an acquisition and conducting appropriate renovation is important from the dual standpoints, reducing opportunity losses and further expanding its earnings. In order to address those challenges, Ken Real Estate Lease fully manifests the renovation skill that it has cultivated through its residence and office building businesses to successfully jump-start the operation of the property that being renovated. We conduct all processes of our renovation work, from design and material selection and procurement, construction management and property handover, with all in efficient manner., and are also capable of completing renovations with a level of astonishing speed that was previously inconceivable with conventional hotel repair work in the industry. Ken Real Estate Lease Ltd. all right reserved.